Oh, The Thinks You Can Think! is a wonderful Seuss tribute to the endless possibilities of our imaginations. It was first published in print in 1975 and is filled with make-believe places, animals and past-times, all rhyming, of course. As a digital offering, this one is refreshing, with the addition of meaningful interactivity and light animation to enhance the storyline. Each page has dozens of question marks that invite little fingers to tap. After tapping the "?" the picture changes, moving the storyline along in a delightful way that reinforces reading comprehension. Sometimes images appear or disappear, move slightly and even change colors. Like the other Seuss titles by Oceanhouse Media, this one also has lovely narration with highlighting, as well as lots of tappable images (for instance, if you tap the sky, the word 'sky' appears and is spoken aloud). Overall this is a great way to enjoy Dr. Seuss no matter what your age. It is also a great example of an app book with just the right amount of interactive enhancement to enrich the storytelling without overshadowing it. And thanks to Seuss, the storyline is one that is filled with whimsy and encouragement to enjoy our own creativity. In rhyming verse, this book suggests lots of things an imagination can conjure. There are things like animals, colors, buildings and even whole worlds of make-believe with funny made-up names like "Schlopp" and "snuvs". A flying balloon swimming pool isn't hard to imagine, even. Or flying 'bloogs' that look like fish in the air. It's all possible if you let your mind wander! 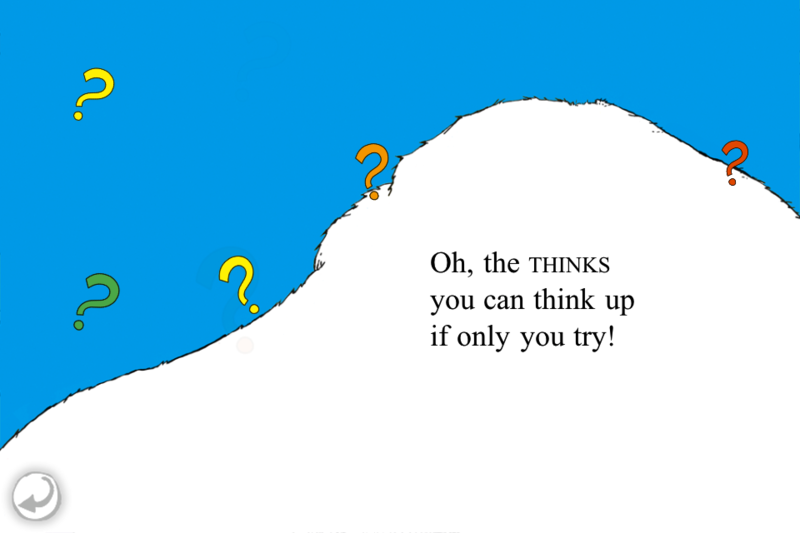 For more information on how to use this book for teaching children about philosophy: http://www.teachingchildrenphilosophy.org/wiki/Oh,_the_Thinks_You_Can_Think!